This MRI with contrast shows heterogenous interstitial fluid flow in glioblastoma. The tumor border is outlined in red. Credit: Kingsmore et al. Interstitial fluid transports nutrients and removes waste between the organs and tissues in our body. In the brain, interstitial fluid is thought to be composed of circulating cerebrospinal fluid, cellular waste and blood plasma, and past research has shown a link between interstitial fluid flow and an increased invasion rate of glioblastoma, or brain tumor, cells. 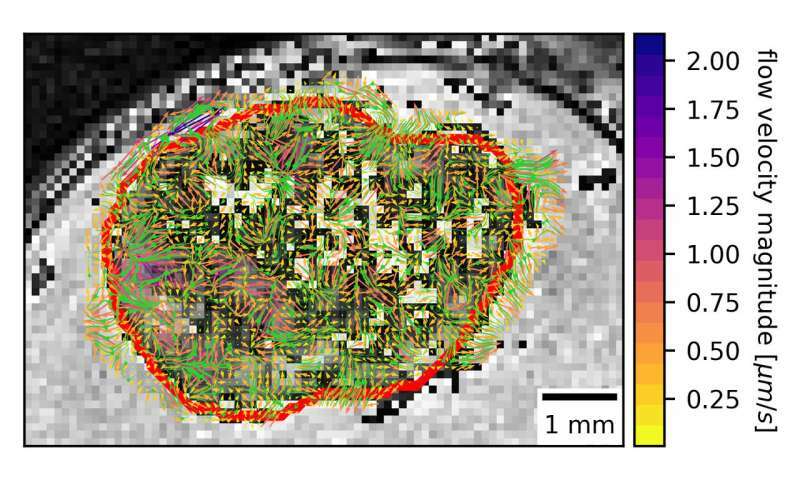 A team of biomedical researchers and electrical engineers from the University of Virginia and Virginia Tech recently developed a new method to measure and reconstruct interstitial fluid flow velocities in the brain. This method gives researchers a first look at interstitial fluid flow dynamics in glioma models, and the technique can readily translate to clinical models already using contrast-enhanced magnetic resonance imaging (MRI). The team describes their method in a special issue focusing on the "Bioengineering of Cancer" in APL Bioengineering. Since the interstitium was "discovered", this is a great area of research, especially regarding metastasis of cancer. We could save a lot of lives moving money going into climate change research into research of the interstitium.